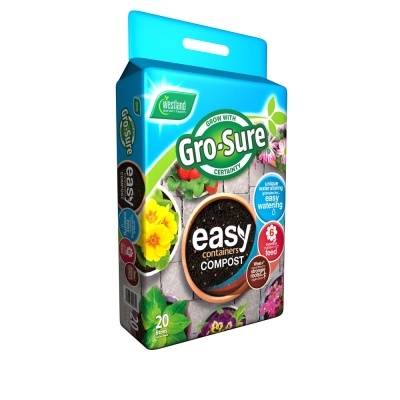 Westland Gro-Sure® Easy Container Compost 20ltr Bag containing unique water storing crystals, and 6 months rich nutrient feed, is a must for container growers. Watering and feeding regimes have long been a large downside of container gardening, whether it be pots, containers, baskets or planters. Gro-Sure addresses that balance with the unique formula that retains and supplies nutrients, and holds and moderates water supply to the plant. Gro-Sure ® Easy Container Compost benefits from the West+ ® Natural Fibre Technology producing stronger roots & bigger plants.